The Earls Barton Neighbourhood Plan Group have analysed the replies in the first two surveys and now we are developing your Neighbourhood Plan. 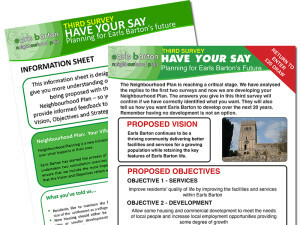 The third survey will confirm whether the Group have correctly identified what you want and also tell us how you want Earls Barton to develop over the next twenty years. REMEMBER! Having no development is not an option!